When you’ve made the decision to buy a new home, finding the perfect home for you often goes hand-in-hand with finding a great neighborhood. If you think about it, why shouldn’t your immediate surroundings be as important as the place where you lay your head each night? With this being said, here are some things to consider for locating a neighborhood where you can be totally satisfied. It’s always a personal wellness booster to see neighbors out in their yards talking with each other or riding their bikes through the community with their kids. This is a great sign of safety and vitality that shouldn’t go unnoticed if finding the right neighborhood is important to you. Home Owner’s Association or Not? As a Realtor for many years I see buyers go both ways on this. Some like the idea of living in an HOA and some don’t. This an important factor to consider if you do have a preference. For instance, you wouldn’t want to fall in love with a home only to find out that the neighborhood had an HOA (if you hated HOA’s). So, if this is important to you, make sure that your Realtor knows so they won’t be showing your homes that you don’t want to see. Everyone has their own needs when it comes to their neighborhood. You may be a very active person and like to play tennis. If this is the case, you may prefer to buy a home in a neighborhood that has its own tennis court. One of the great things about having neighborhood amenities is not having to keep them maintained. For example, I used to live in a community that had 2 outdoor pools and a hot tub. It was great to have these features to use as much as we want, especially knowing that we never had to vacuum it or mess with chemicals. Yes, we had to share but again, no vacuuming! Neighborhood amenities are nice but that’s part of what your HOA fees go toward. If paying $50 or so a month to have some of these features is worth it to you, then by all means, put that on your wish list for your next home. Driving into a neighborhood for the first time is just like walking into a new home. Sometimes you just get a good feeling about the community as soon as you get there. Some of the elements of a neighborhood that could bring a good feeling are: properties are kept up, the streets are wide, neighbors are out chatting, there are lots of trees, and folks show pride of ownership. Take some time to visit an Open House and talk with some residents. Another great idea is to visit the neighborhood at least 3 times: during a weekday, at night, and on the weekend. 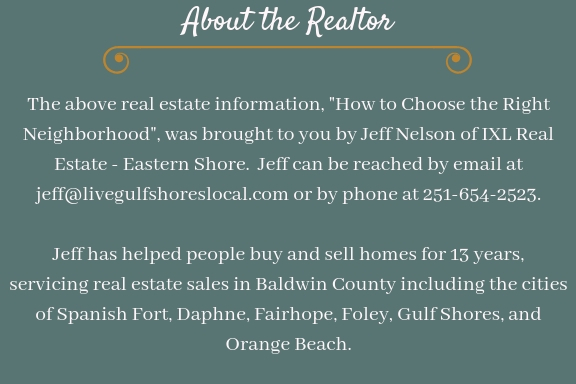 Most parents will tell you that living in an area that’s in a top-notch school district is high on the list for choosing a new home or neighborhood. Another plus is that homes in great school districts usually have higher property values so selling in the future will more than likely bring you a better profit. Be sure to check out school scores and their boundaries. For instance, there’s a large neighborhood in our area where the city line runs through it, hence 2 different public school systems. 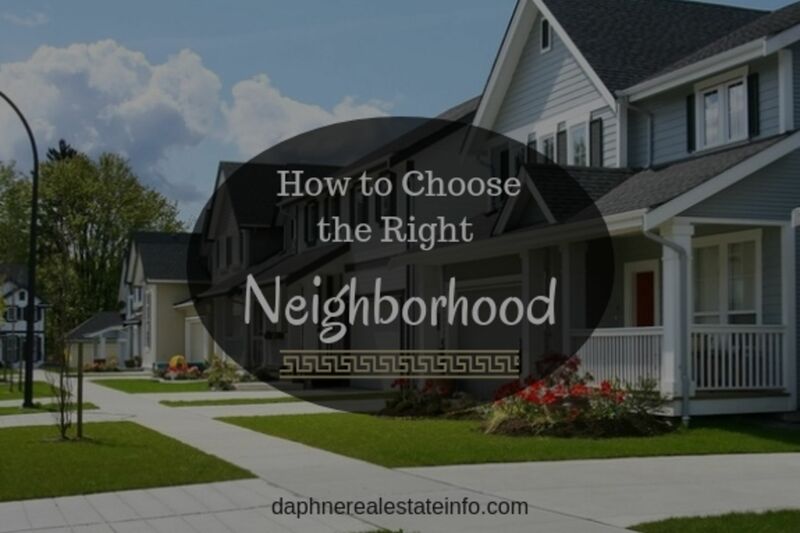 This is good information to have in choosing the right neighborhood if you have kids. When finding the right neighborhood for you, you may want to consider what’s around the community. Do you want to be near shopping and restaurants? Is having a nearby park important? Would it be great if the kids could walk to school? Buying a new home is exciting and it’s all about you! Figure out exactly what you want inside and outside the home. Typically, neighborhoods with a high ownership rate are more stable and promote less crime. Not to say that renters are going to steal from you but if the majority of the properties in the neighborhood are a primary residence to someone, neighbors will tend to look out for one another. There are a number of online sites, like homefacts.com, that can give you an idea of ownership rates for various areas. When choosing a home and a neighborhood, you should write down the aspects that you “have to have” and those that would be “nice to have”. Oftentimes our budget doesn’t give us everything that we want but we can get most everything that we need. Either way, you may have to compromise a little on the house or the community to come close to choosing the right neighborhood for you.